Interferential Current (IFC): IFC is a medium frequency waveform. The current is distributed through two channels (Four electrodes). The currents cross each other on the body on the area requiring treatment. The two currents intersect with each other at this crossing point, resulting in a modulation of the intensity (the currents intensity increases and decreases throughout the treatment). This is excellent for acute injuries like knee sprains, but is also effective for chronic problems and spinal disc syndromes. Transcutaneous Electrical Nerve Stimulation (TENS): TENS is a method of electrical stimulation which primarily aims to provide a degree of pain relief (symptomatic) by specifically exciting nerves stimulating the pain gate mechanism and/or the opioid system. TNS is often used for headaches and also is used in pregnancy and delivery. See Products for an inexpensive, high-quality machine we carry. 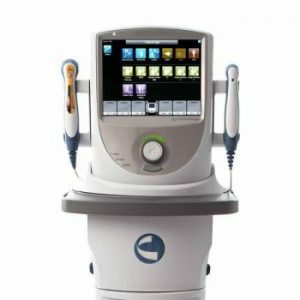 This combines the benefits of ultrasound with a simultaneous muscle pumping action for tight, chronic or spasmed muscles. Combo is a unique feeling and a patient favorite.